Chelsea footballer Eden Hazard says he is keen to win the Champions League title as his club begins its European campaign with a group stage match against Azerbaijani side Qarabag on Tuesday. Hazard joined Chelsea shortly after they won their first Champions League title in 2012 but the London side have not won the competition since. It came close in the 2013-14 season but lost to Atletico Madrid in the semi-finals. Chelsea failed to qualify for the Champions League in the last campaign and as they prepare to return to Europe's elite competition this season, the Belgium international is hopeful that his team can seal the trophy. "Yeah, this year (to win it) is important... I have only got to the semi-final when we lost to Atletico Madrid. So it's in my head to win this trophy," the 26-year-old told British media. "I have won the Premier League and the title in France. Now all the big players want to win the Champions League." 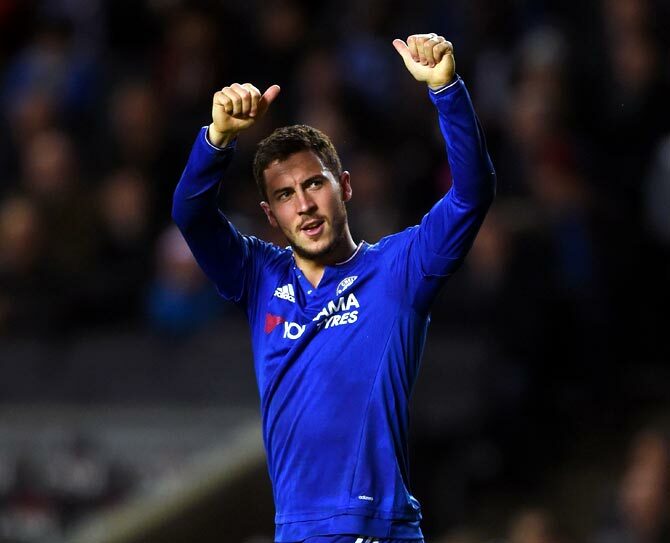 Hazard played his first game for Chelsea this season in Saturday's 2-1 league win over Leicester City, after recovering from an ankle injury sustained in June. "It was a good test (against Leicester). I'm just happy to be back," Hazard added. Following their Champions League encounter, Chelsea host London rivals Arsenal in the league on Sunday. EPL snapshots: Crystal Palace sack manager Frank de Boer? Retracing Rafa's run to Sweet 16!